No 18 Bun a Chnoic. 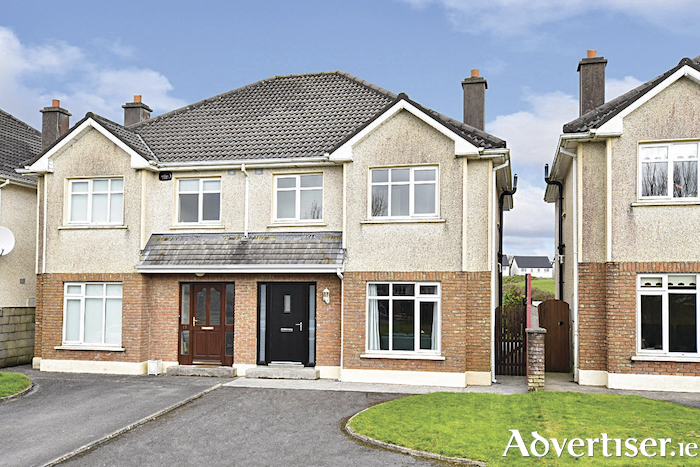 Number 18 Bun an Chnoic is a spacious four bedroom semidetached residence which is tastefully presented and in pristine decorative order throughout. This quality, well-proportioned, residence would be an ideal home in a mature and well established development built by Goaley Construction. Number 18 is ideally positioned overlooking a large green area to the front and is not overlooked from the rear. The residence, which is presented in pristine decorative order, benefits from recently fitted composite front and back doors, new carpets, extensive tiling, built-in wardrobes to the bedrooms, a driveway with off street parking for three cars, and a very large attic (some of the adjoining houses have converted their attic space ). The ground floor has an entrance hall with tiled floors and understairs guest wc. The living room to the right is a bright and generously proportioned room decorated in a very on-trend colour scheme and with new carpets to the floor. The living room boasts a large window overlooking the green area to the front, and has an open fireplace and double doors which lead through to the kitchen/dining room. The spacious kitchen/dining room has a range of fitted kitchen units and tiled floors. French doors open to allow direct access to the rear patio and garden. Off the kitchen/dining room is a utility room with tiled floor and composite door leading to the rear. Moving up the newly carpeted staircase, there is a large landing with shelved hotpress. There are four bedrooms on the first floor, all with newly carpeted floors and built-in wardrobes. Three of the rooms are doubles and the fourth is a generous single/small double room. The master bedroom benefits from a fully tiled en suite with window and there is also a main fully tiled bathroom with window and electric shower over the bath. Outside, there is a lawn and driveway to the front and a side gate leads to the rear. The rear garden is enclosed and has a lawn, concrete patio, and boiler house. Bun an Chnoic is ideally located close to all local services and amenities including shops, supermarkets, bus service, schools, créche, hotel, Tom Sheridan's Bar & Restaurant, and is within a short drive of NUIG, UHG, and Salthill. This superb property is sure to appeal to anyone seeking a spacious, ready to occupy, home in pristine decorative order in this very attractive residential development. For further details see www.mulleryauctioneers.ie or call Mike Mullery of Mullery auctioneers on 087 6424106 or 091 567275.